I have been looking for descendants of my relatively close ancestors in hope that they will lead to DNA matches. This week, I've been looking at Dill descendants of my Thomas and Hannah (Horton) Dill, and noticed that there was a family in the 1900 U.S. Census in East Orange, New Jersey headed by Jas. B. Dill (born in 1857 in Connecticut), married to Mary W. Dill (born Jan 1860 in Pennsylvania), with three daughters (Emma (age 18), Helen (age 17), and Susie (age 13). The same family was in the 1910 U.S. Census in the same place with consistent ages, but without Emma. When I looked at the Suggested Records for James B. Dill, one of the suggested records was from the "Pennsylvania Death Certificates, 1906-1964" database, which turned out to be a death certificate for Susan Trump, who was born 25 July 1886 in East Orange, New Jersey, daughter of James B. Dill and Mary Dill, and died on 10 October 1858 in Philadelphia, Pennsylvania. I think that this is the Susie Dill of the 1900 U.S. Census! The husband is listed as William H. Trump (deceased). That caught my eye for the obvious reason! Is there a marriage record for Susan Dill and William Trump? Yep - a suggested record for William H. Trump was from the "U.S. Presbyterian Records, 1743-1970" for a marriage on 7 June 1910 in Germantown, Pennsylvania for Susan Hansell Dill (born in East Orange, N.J.) and William Henry Trump (born in Germantown, Penn.). There are also Find A Grave records for both William Henry Trump and Susan Dill Trump buried in Ivy Hill Cemetery in Philadelphia. There are New York Passenger List records for both William and Susan Trump. 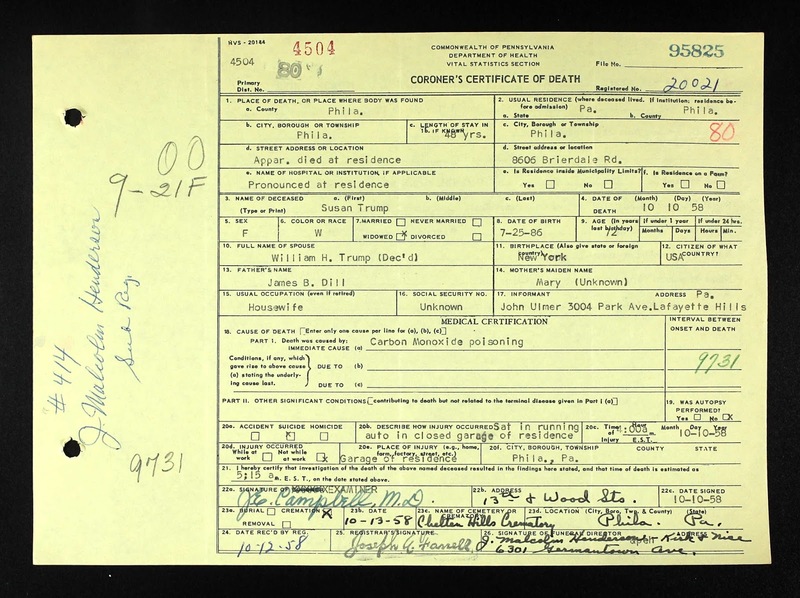 There was a 1930 U.S. Census record for William and Susan Trump which showed no children. I could not find census records for 1920 and 1940. What about children? A search for records for William Trump in Pennsylvania found Pennsylvania Death Certificates for sons John B.D. Trump (1911-1911) and William Henry Trump Jr. (1913-1917). So there were two children, but they died in childhood, leaving no descendants of Susan Dill. Bummer, no DNA cousins here. But, there is a bright side here - there are records for Susan's sister, Helen B. Dill who married Daniel Heald, and they had three children listed in the 1940 U.S. Census. Cousins! I know this isn’t going to help you with your DNA project, but I took note that you were not able to find William Henry Trump and Susan Dill in the 1920 and 1940 census and thought I would give it a try. The 1014 W. Hortter Street is an address that I have passed many times and that made the challenge interesting to me. The first thing that I did was look for all of the documents for the Trumps that contained an address. In 1920 I found William and Susan Frump at 715 W. Hortter Street. In 1940 I found William and Susan? Trumb at 1014 W. Hortter Street. The 1935 Philadelphia City Directory had the correct house number but Upsal is a parallel street one block south of Hortter. The 1920 census would seem to indicate that William and Susan didn't have any surviving children.